Skate Girls Tribe is coming to Baltimore, MD, to be part of the House of New Beginnings and Tavon Mason Loves the Kids Foundation on Friday, May 31st, 2013. 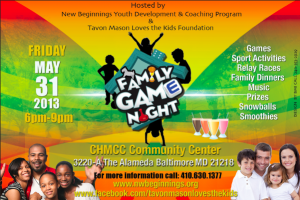 We are very thrilled to be part of the Baltimore Community “Family Game Night” 2013. Skate Girls Tribe will bring decks for kids. We will have prizes and good times for all. This entry was posted in BLOG, Events and tagged baltimore, help, kids, Skate Girls Tribe, skating, sPACYcLOUd. Bookmark the permalink. Roll Skate Shop from Olney MD Supports SGT skate event on May 12th @ the Bridge Spot in SE DC. I’m still excited that Spacy cloud and skate girls tribe will grace their presents in my city of baltimore,md. I def believe this is a culture that needs to be introduced to the city to allow children to come out of their comfort zone.